You can introduce many variations into your models through the COMSOL Multiphysics user interface (UI). Functionality, such as parametric sweeps and optimization, allow you to vary a set of parameters in tailor-made edit fields for this purpose. Yet, some types of variations are not catered to by the UI. In these cases, LiveLink™ for MATLAB® comes in handy as it can access all the model settings, using the COMSOL® API for use with Java® (COMSOL API). Connect to other data sources and read data from files, databases, etc. Many of these features are important if you wish to avoid repeating your work in the COMSOL Multiphysics UI. If you are new to LiveLink™ for MATLAB®, then the Introduction to LiveLink™ for MATLAB® manual provides sufficient information to get you started. In particular, the LiveLink™ for MATLAB® User’s Guide provides further resources about the commands within the COMSOL Multiphysics API and the equivalent MATLAB® functions they access. You can actually create your first model M-file, which controls a COMSOL Multiphysics model, without having to read this documentation. This is because such scripts can be auto-generated from the COMSOL Multiphysics UI. 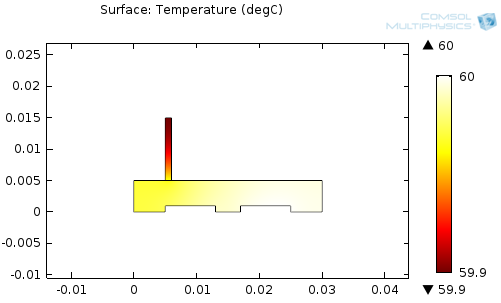 Let’s look at a simple heat transfer example that only requires the COMSOL Multiphysics base package to build and solve. 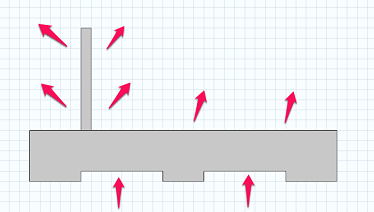 The geometry can be seen in the following figure, where a heat flux is introduced at the bottom boundaries and dissipates into the surrounding air at the top boundaries. Here, the code is commanding COMSOL Multiphysics to create rectangle nodes in the model tree, as well as the node that takes the difference between rectangles. You see that the size and position (pos) of the entities are defined. These definitions can be used to define the geometry as you’d like it to be. It is evident that even small geometries may lead to a lot of defining code. The next section shows how to create lines automatically. All functionality within COMSOL Multiphysics can be represented by a line of code, and a full model would correspond to many lines of code. Instead of creating a model from scratch using a script, you can create it in the COMSOL software UI and then save it as an M-file. This is done by choosing File > Save as and then selecting “Model File for MATLAB (*.m)”. Such an M-file contains all the steps that have been followed when building the model. By running the file using LiveLink™ for MATLAB®, you will notice that all the commands that were performed are recorded. If the model was solved several times, there will be several calls to the solvers, which you typically don’t want. If you were to run the model from the MATLAB® command line, it will solve the model several times. In order to obtain an M-file that is compact, you can choose File > Compact History before saving the file. Now that we have the entire model as an M-file, we are free to investigate — or change — any of the settings in the model. We can add new features to the model, as well. Have a look at your M-file and see if you can identify the various sections of the model and how things are set up. Some things will be easy to understand in a model, such as how parameters and the geometry are defined. Other things, such as solver or plots settings, can be more obscure. However, if you have MATLAB® coding experience, you should easily be able to see where things are defined. If you use MATLAB® to change a model using the COMSOL software API and lose track of changes, it is nice to know that you can always save the model as an MPH-file, load it into the COMSOL Multiphysics UI, and inspect it there. Furthermore, you can load MPH-files into MATLAB® and manipulate them from there, as well. The following example loads an MPH-file and performs a “for” loop on the parts of the model that has changed (its geometry) before solving it. The above code sets up some of the heat transfer physics, including two boundary conditions for a “Heat Flux Boundary” on a series of boundaries, identified by numbers. When a geometry is changed in a way that introduces more domains, boundaries, or vertices, these numbers will change too. You will need a way to either track these numbers, or avoid using them. These will be the topics of the next two blog entries in this series. Stay tuned. Thanks for useful blog! I tried to ‘compact history’ in my rather larger MPH file and I got the error ‘Unknown model parameter’. Is there any way to workaround this? COMSOL analyzes the structure while performing Compact History, but sometimes has to give up. Please send the MPH-file to support@comsol.com so we can have a look. I use every day Matlab Livelink with comsol, and I think it is very efficient. It is a fantastic tool when you combine Matlab advantages (graphics, data posttreatment, highlevel mathematical functions such as FFT, matrix operations) with Comsol advantages (multiphysics approach, numerical computation of complex physical problems). That’s why I am trying to compile matlab programs using Matlab compiler. The idea is to be able to distribute exécutables that would use a Comsol licence and Matlab runtime libraries. I am trying to compile a simple script that opens some .mph model, using mphload(). Untill now, I always have some bug at runtime. 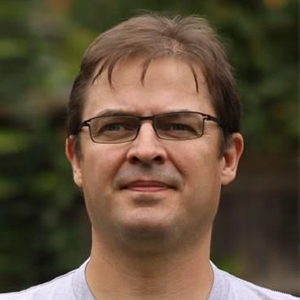 It is probably a matter of setting correctly the path to the .dll and java files that are needed at runtime. I discussed with Comsol but they don’t support matlab compiler, and of course matlab do not support compilation of comsol exécutables. So, if someone ever tried, and has a procedure, or at least some experience, I would be very very glad to know it ! Although not officially supported applications compiled with the Matlab Compiler should work together with Comsol Multiphysics. When creating your application then include a call to mphstart at the beginning of your application. Make sure to use one of the variants of mphstart that includes a COMSOLPATH. Make sure you use the correct COMSOLPATH at runtime. Comsol has to be installed on the computer in order for the application to run. If this doesn’t work then please contact support and we’ll see if we can help you. Please include the version of Matlab and your operating system that you are using in the message to us. Nice blog entrances on Matlab livelink. Some of those useful tricks I learned on the way, by creating a model, compacting the history and saving the m-file to check some syntaxis errors and similar. The program that I did, creates new geometries during the execution process calling different comsol-functions from matlab. Always when the meshing crashed and red text came to the matlab command window, indicating an error and that the execution was cancelled. I’ve been stocked here for a long time, do you have any suggestions? Without seeing your script it is hard to guess what goes wrong. It is quite easy to run out of memory when you are creating a large model using a script since you can easily create thousands of geometric objects, physics and settings, which all take up memory, of course. each subsequent statement you execute will add some information to the model history. This is done such that you later can export an M-file (or VBA- or Java-file) with all you steps. However, exporting such files are rarely useful (since you already have a script that can do what you want) and you can always use “Compact model history” to get what you want. If this doesn’t help your case then please send your script/model to Comsol Support where we will have a look at it. Thanks for your useful blog. I have used COMSOL live link with MATLAB for optimization. My optimization code is written in MATLAB and as the objective function I build a comsol model, run that and use its results. The problem is that when I call the objective function from the optimization code, after 8 to 9 times of calling, the model exits with the error that the solution is not found. However, when I call the objective function separately, with the same inputs from MATLAB, it runs completely. I think the problem is that the previous model is not closed from the last call. How can I close a model in MATLAB Live link? I would really appreciate if you could help me with it. The most common problem we see when a model doesn’t give a solution when performing optimization is that the parameter values that are determined by your optimization code go outside of the area where the model is well defined. Also you must make sure that the initial values for your model are consistent with your new parameter values. You can use ModelUtil.remove to remove a model from the Comsol Multiphysics Server, but you should rarely use that. Simply reload the model using mphload whenever you start a simulation. This way you are certain that your simulation starts with a known state. If you continue to have problems with your model you can send it to support where we will have a look at it.